Implementing NetSuite package is just half the battle. The other half involves running NetSuite applications effectively while maximizing functionality and optimizing investment. 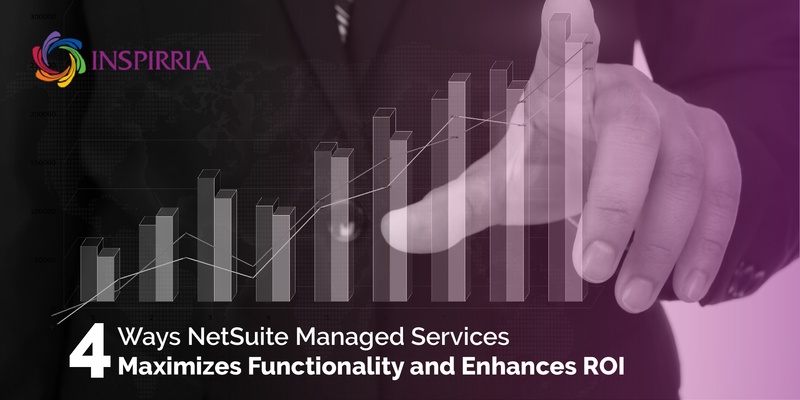 Inspirria’s Managed Services team skilfully handles re-implementation and reassessment services for NetSuite applications. This includes discovering IT issues, identifying missing configurations and re-implementing applications. The result: faster turnaround time on processes and increased system efficiency. Whether you use NetSuite as an ERP or CRM, adding on new NetSuite application involves thorough planning, aligning NetSuite capabilities with business needs, validating processes, process automation and maximizing effectiveness and accuracy of NetSuite. For instance, if your company decides to extend NetSuite functionalities for a new setup or subsidiary, it needs to ensure compliance with local government regulations. Inspirria Managed Services enable you to expand your NetSuite requirement and customize NetSuite modules based on the scale of the company, the number of employees and local regulations. Businesses need faster and more responsive service across all channels. Integrating third party applications such as Salesforce CRM with NetSuite speeds up understating of customer needs to serve them better. Inspirria Managed Services ensure successful third party application integration leveraging a proven methodology. It links customer accounts, migrates contacts, updates invoices, and tracks the inventory and payment history. Succeeding in today’s competitive environment requires continuous uptime, rapid troubleshooting and customized services. Inspirria’s Platinum and Gold support packages are geared to rapidly resolve service issues, create custom reports as per requirement, automate and schedule reports for stakeholders, perform custom approval validation, and drive beta and release preview testing. Additionally, our GST and VAT configurations and tax reporting helps organizations navigate tax complexities and enhance compliance. Inspirria is a leading NetSuite partner offering end-to-end managed services comprising application development and reassessment support. We leverage more than 14 years of experience and data-driven strategic cloud assessment capabilities to help companies fast track NetSuite services implementation and maximize ROI.